Wholesale lace, ribbons, trims, findings, supplies and tools for miniatures, doll makers, egg art, quilting, French hand sewing, ribbon embroiderywe are workin f timPlease allow 2 weeks for your order to be filled. News....Buckle 477 now comes in Antique Gold!! GOOD NEWS..... 2 MM SILK RIBBON, WHITE, NATURAL, BLACK AND CREAM BACK IN STOCK, I am happy to report. I am sorry I no longer have a catalog, only the web site. Sandy's Lace and Victorian Trims sells wholesale, French cotton laces, Maline laces, vintage laces, trims, silk ribbons, Bunka, Buds n Bows, eyelash picot, French trims, Swiss embroideries, cords, hat straw, doll hair, findings and sewing notions that are ideally suited for miniatures, egg art, doll making, ribbon embroidery, French hand sewing, quilting, as well as others that use quality products. Our laces, trims and ribbons tend to be narrow, small, delicate and elegant in design. The materials used are mostly natural and can be sewn or glued. Do keep in mind that we only sell wholesale: There is no dollar minimum to order, but there are minimum lengths, put ups, cuts or quantities on most of the items. Larger quantities are available. It is not necessary to log on to view the products. However, to see our wholesale prices and place orders, you will need to create an account by registering and creating a password. To create an account, you must be a qualified reseller (for qualifications, click on Conditions of Use). Click the Log In link at the top the page to register. Sandy's has been in business for over forty years and ships anywhere in the world. If you have questions or need additional information, please send an email by clicking on Contact Us. Thank you for visiting Sandy's Wholesale web site. 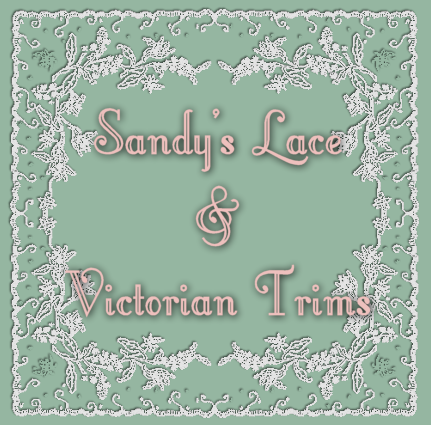 Hopefully, Sandy's can be your source for laces, trims and ribbons.